Bob Mulligan, Ph.D. developed Whole Nectar Smoothie Mix out of the conviction that most people could change their lives dramatically in terms of health and increased energy with just a few small changes. Specifically, they need to get more whole foods, more fruits and vegetables in their diet, and of course, get more physically active. Well, what better way to get moving toward more vitality and more energy than a home blended smoothie? Bob and his wife Wendy spent the better part of the last two decades spreading that message across the United States at food demonstrations and health and fitness shows. About a million smoothies later, a lot of people had learned the basics of blending and were left with the realization that blending whole fruits and vegetables into delicious concoctions was not only the best flavor option but also the most nutritious. Over time, more and more people wanted to know if there was a high-quality protein powder that was made of whole foods, rich in protein, and tasted really good. That's when we went to work. 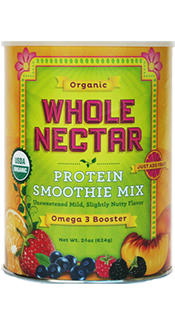 After a thousand formula tests and the discovery of a tasty non-GMO soybean, we hit a home run--Whole Nectar Organic Whole Soy Protein Smoothie Mix. As any smoothie lover knows, the best "meal in a glass" smoothies have a healthy portion of protein added to the juice, fruit, and ice. The protein typically comes from yogurt, milk, whey, or soy. There's no question that soy, Mother Nature's only plant-based complete protein, is a great choice. After all, everyone from Andrew Weil, M.D. to the FDA has supported adding soy to a healthful diet. The problem we experienced in our smoothies, however, was that when we added soy milk, our smoothies tasted good but were too low in protein. Using processed soy protein isolate raised the protein content of our smoothies, but the taste wasn't that great. That led to the development of Whole Nectar Soy Protein Smoothie Mix, the only soy protein powder on the market that's made with organic whole soybeans. And a perfect complement for any smoothie: rich in protein with a delicious, creamy flavor. So get that high-fat fast food out of your face and blend a nutritious, delicious Whole Nectar smoothie.